The company employs modern, state-of-the-art manufacturing machinery and processes to achieve superior quality products that not only meet international standards Requirements but also minimize the causes of powder and latex-related allergies.In this respect, the factory endeavors to continually upgrade product quality and technique, particularly in the powder-free and synthetic polymer types of medical gloves. Produce steam for use in manufacturing. Systematically Pollution control and perfection. Energy from palm shell. 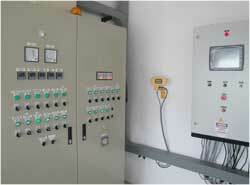 Mixed with chlorine to produce accurate and precise with PLC Control. Precisely because inspection gloves with modern machinery. Quality inspection and product research with lab quality.